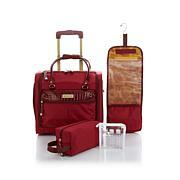 Your essential travel set is here! This ultra lightweight trio offers you everything your intrepid spirit needs to take to the skies in style. With loads of organization features and a user-friendly profile, this lightweight luggage makes packing up and taking off easier than ever. Weight: Large upright approx. 7.8 lbs. Pilot case approx. 6.2 lbs. Max Capacity: Large upright approx. 50 lbs. Pilot case approx. 40 lbs. Max Capacity: Approx. 20 lbs. The set is beautiful and spinner wheels are the best. 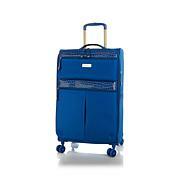 Very sturdy, made well - so glad I made the purchase - this was first Samantha Brown items I purchased very impressed and just ordered the lightweight weekender. 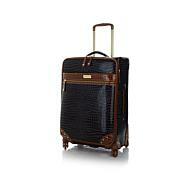 Love this luggage! The quality is top notch! Very easy to pack & to pull! Samantha thought of everything with this set. I found useful pockets in convenient places. So much lighter Than my recent purple purchase. Lots of room, rolls easily with the spinner feature. Would recommend highly, just needs a side handle on both sides and a longer tab on tote to snap. I purchased this set when it was a TSV. Got a fantastic deal on it. Daughter and husband going on a cruise. This will be perfect for them. Her mother in law even borrowed it when she went on a weekend getaway. I bought the navy -- gender neutral I thought. She loves it. 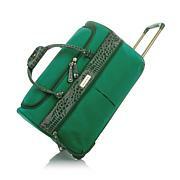 I also bought the packing cubes and the Expandable Cabin Bag, also a TSV, which she uses when she comes to visit. She loves that piece. Great luggage. Thank you. I love to hear all your travel tips too.